OTTAWA – The Canadian housing market continued its cooling trend in August with starts falling by all three of the measures used by the Canada Mortgage & Housing Corporation (CMHC). By the trend measure, housing starts totalled 214,598 units on a annualised basis last month, compared to 219,656 units in July, a decline of about 2.3%. The trend measure is a six-month moving average of the monthly seasonally adjusted annual rates (SAAR) of housing starts and is used by the federal housing agency to account for swings in monthly estimates, which it says can be misleading, as they are largely driven by the multi-unit segment of the market which can vary significantly from one month to the next. 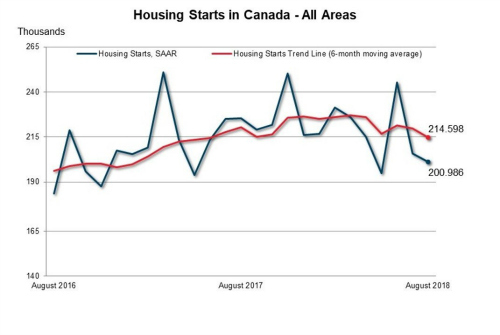 The standalone monthly SAAR of housing starts for all areas in Canada was 200,986 units in August, down from 205,751 units in July. The SAAR of urban starts decreased by 2.5% in August to 184,925 units. Multiple urban starts decreased by 2.4% to 132,700 units in August while single-detached urban starts decreased by 2.6% to 52,225 units. Actual starts were down by double digits for both single family homes in urban areas – defined as towns with populations of 10,000 or more – and the multi-unit segment. CMHC pegged single family home starts at a preliminary 4,748 units in August – down 18% from the 5,782 units begun in August 2017. The decline was felt in every region of the country, except Atlantic Canada where they gained 3.0%. For the opening eight months of the year, single family starts were down 13% to 36,318 units – compared to 41,576 units for the same period of 2017. Taking the biggest hit was Ontario, where starts were down 18%. But, once again, the only region showing an uptick was Atlantic Canada where starts were up 10% for the year-to-date. Meanwhile, multi-unit segment starts – whether apartments, townhouses or other linking dwellings whether for the condominium or rental market – fell 10% in August to 10,823 units, from 12,039 units for August 2017. The decline was most keenly felt in Ontario and Quebec, as the Atlantic region, the Prairies and British Columbia all saw healthy upticks. However, for the year-to-date, multi-unit segment starts were up 5% to 91,027 units. Gains were recorded in Atlantic Canada, Quebec, Ontario and B.C. with only the Prairies showing a downturn. For the year-to-date, total starts were up a modest 1% to 127,345 units thanks to overall gains made in B.C., the Prairies, Quebec and Atlantic Canada in the first half of the year. In his research note, Rishi Sondhi of TD Economics pointed out the declines were led by drop-offs in housing construction in Canada’s three largest cities – Toronto, Vancouver and Montreal. He also noted that housing starts are proving to be softer in the third quarter of 2018 than they were in the second. “Still, residential investment overall is likely to add to growth, driven by rising resale activity,” he added.